A pair of Smooth Base CD-154 HEMINGRAY-42s waiting for a demolition crew or an insulator collector to take them home. Update: Jason Stevens took these down in the summer of 2001. These were in southern Tennessee, the pole was probably chopped and is laying in the outer area of the R.O.W. This was a common sight after the ice storm in 1994 along the CSX R.O.W. A CD-162 is broken off the pin and suspended in mid-air on the wire. Note that there is the common horseshoe style tie wire. This is an H.K. Porter 106932-W with its long shank pin as found after a pole demolitiuon crew chopped the poles down. H.K. Porters on the upper arm of the pole. The H.K. 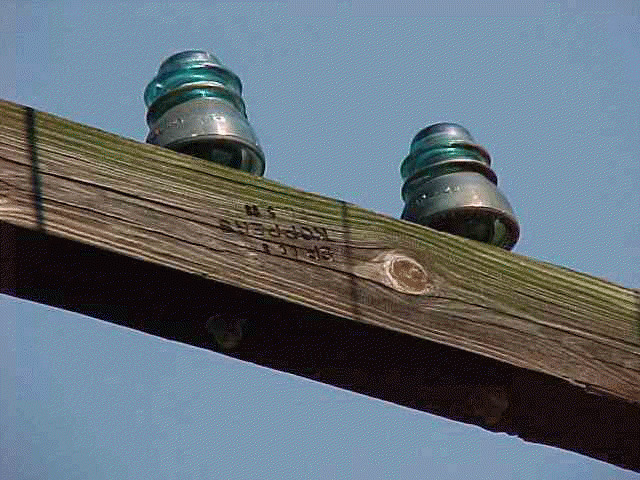 Porter 106932 was made in the 1960s and '70s as replacement insulators. Being made of poly-carbonate resin,they are almost indestructable.